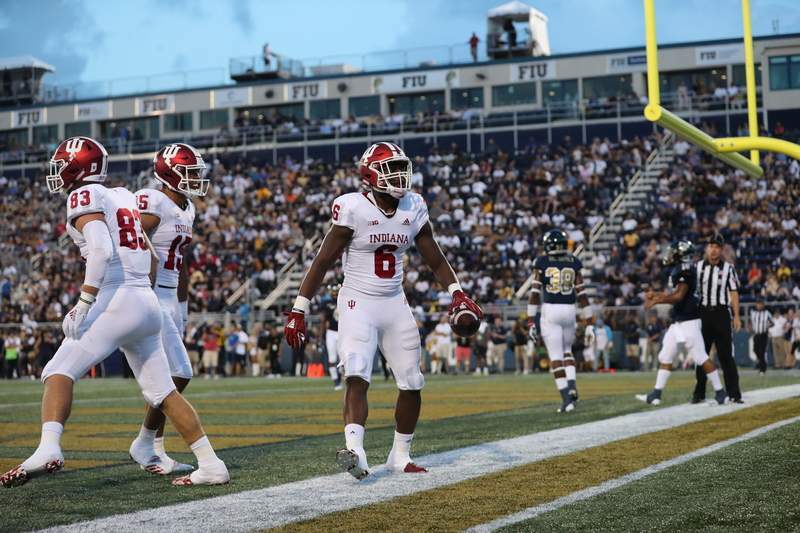 Courtesy Indiana University Donavan Hale's four-reception, 64-yard, two-touchdown performance in Indiana’s week one win over Florida International, he may finally be realizing his immense potential. In a late August training camp, Donavan Hale carried weights along the sideline of Indiana's practice field next to Memorial Stadium. Directed by coaches, Hale and a handful of other injured Hoosiers completed various workouts in their efforts at rehabilitation. For the 6-foot-4, 229 pound redshirt junior receiver, the image was an all too familiar one. Plagued by injuries and inconsistencies over his three years in Bloomington, Hale has been a tale of what-ifs. But after a four-reception, 64-yard, two-touchdown performance in Indiana's season-opening win over Florida International, he may finally be realizing his immense potential. Since the exodus of Simmie Cobbs Jr. to the NFL last year, IU has needed another big-bodied deep threat to emerge alongside Nick Westbrook. Enter Hale. Against FIU, he flashed the athleticism that made him a top-flight football and basketball recruit out of high school. Trailing 7-0 in the first quarter in Miami, Hale ran an 18-yard post up the seam into the middle of the Golden Panthers end zone. Once there, quarterback Peyton Ramsey rifled a pass over one defender's head. Hale then snatched the perfectly thrown ball and toe-tapped his way to IU's first touchdown of the season. “After that I was just ready to play,” Hale said. For the average viewer, the catch was spectacular. However, the play was one that offensive coordinator Mike DeBord and receivers coach Grant Heard have come to expect from Hale. “My room is built with different bodies and they've all got different skill sets, but he is a big wideout that can make contested catches and he has really good hands,” he said. “So when I see him do something like that I'm not shocked because I've seen it before. From a confidence perspective, Hale points to his position coach as his primary motivator this offseason. Heard is admittedly tough on his receivers, explaining that the harder he makes practice, the easier games become. That said, building confidence has proved to be a difference for Hale early this season. To be fair, one game isn't a perfect barometer for what Hale will be this season. A Largo, Florida, native, he had his mom, brother, cousins, aunts and uncles in attendance at FIU. That late August rehab session was a reminder of the hurdles Hale has faced over the years. Whether Saturday's confidence-laden performance is something he can maintain is yet to be seen. “For me it was just good to see him out there making plays and kind of getting back in the swing of things,” Heard said.